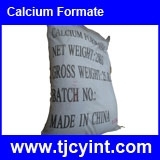 Calcium Formate Suppliers, Calcium Formate Manufacturers. Package: In 25kgs net polywoven bags, lined with PE bag inside, on pallets. Uses : Mainly used as flash set agent for concrete, lubricant, new type feed additive and so on. Room 1309, Wufeng Building, No.11 Zhenxing Street, National Hi-Tech Industrial Development Zone of Taiyuan, Shanxi, China.